Home ❭ Cookies ❭ Chocolate Chip Cookie Cups with Whipped Salted Caramel Frosting! Chocolate Chip Cookie Cups with Whipped Salted Caramel Frosting! Except Memphis decided to be awesome and bring back winter for a week. It’s all 20s, 30s, 40s, and rain here. Yuck. But I’ve got a “new” cookie recipe for you. It’s inspired by Sally and Tieghan. I took some from here and some from there, and BOOM! 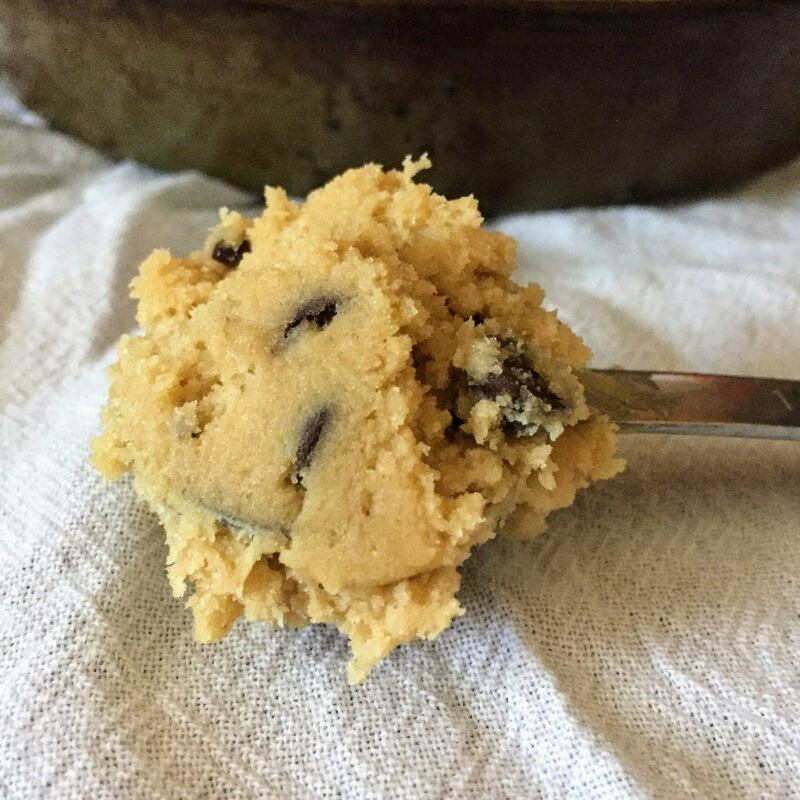 new chocolate chip cookie recipe! 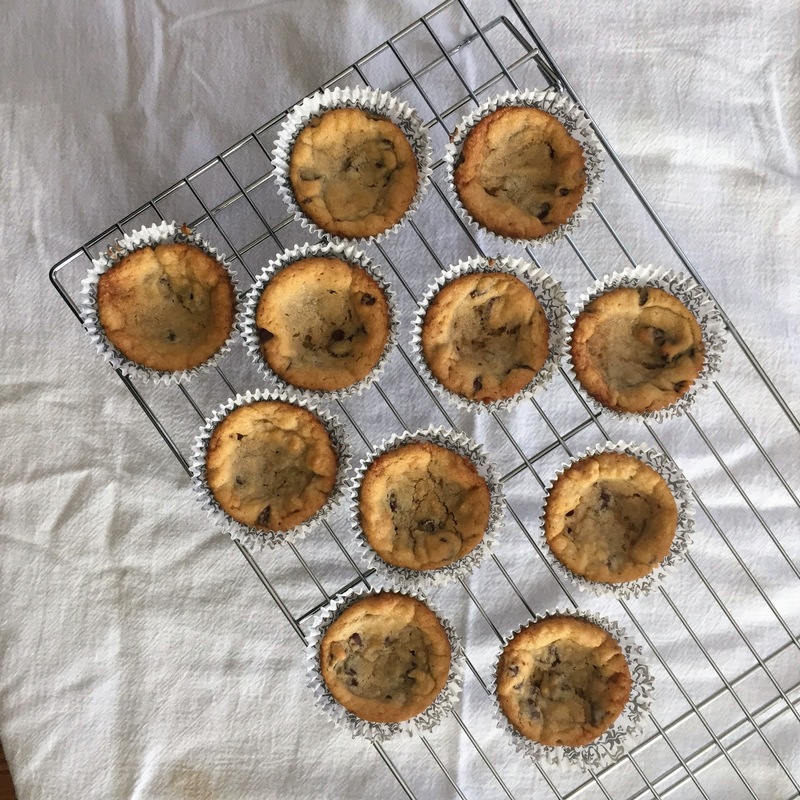 You take your cookie dough, dump it by heaping 1.5 tablespoonfuls into muffin tins (see below), bake, cool, frost, and eat! No pesky refrigeration needed, but if you want to, feel free! You can stop at this point and just eat your cookies, but if you want to kick them up a notch, go for the buttercream! Consider yourself warned. It makes the cookies extra sweet. You’ll probably just want to eat the whole batch of frosting. And then you’ll have to make more to use on the cookies. 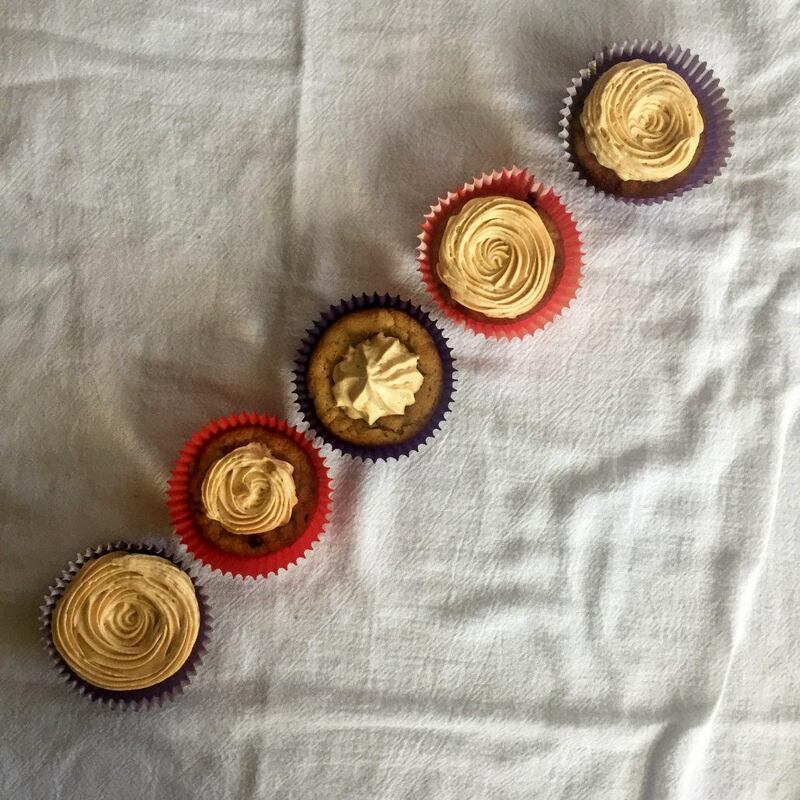 The stuff is pure deliciousness; it’s a new favorite frosting recipe. YAY! I’m no expert at piping, but I tried! If slathering frosting onto baked goods is more up your ally, more power to you. As long as the frosting is on the cookie, you can’t go wrong. No frills chocolate chip cookie cups topped with some of the most amazing frosting you'll ever make! Preheat oven to 350 degrees and line two 12-count muffin pans with paper liners. Beat butter and sugars on medium high until light and fluffy, about 2 minutes. Scrape down the sides as needed. Beat in egg, vanilla, salt, cornstarch, baking soda, and salt, mixing until combined on medium speed. Mix in half of the flour on low speed until combined. Then add the remaining flour and mix until combined. The dough will be thick at this point. Stir in chocolate chips once flour is evenly dispersed. 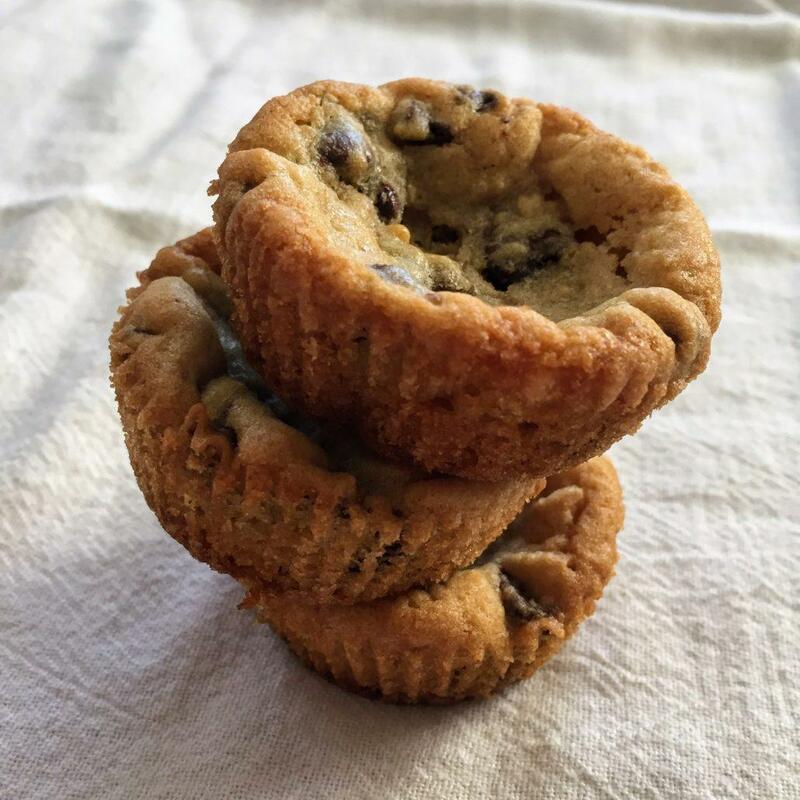 Spoon a rounded tablespoon of cookie dough into the lined cups of the muffin tin. (For me, a rounded tablespoon measured between 1.5-2 tablespoons of dough.) Don't worry about flattening or rounding the dough balls; they will settle in the oven as they bake. Once pan is prepped, bake cookie cups for 11-13 minutes, checking at the 10 minute mark. I baked mine for 10-12 so they would come out soft. Allow cookie cups to cool completely on a wire rack or in the muffin pan before frosting them. They will sink a little; don't worry! Beat butter and powdered sugar together on low until combined. Then switch mixer to high setting and beat until fluffy and creamy, about 5 minutes. Add dulce de leche, vanilla, and salt, and beat on high for 3 minutes, until combined and light.